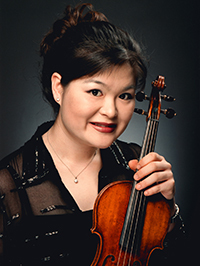 This Friday evening, January 12 at 8:00, a trio consisting of Michelle Kim (photo, by Chris Lee), assistant concertmaster of the New York Philharmonic, on violin; Wendy Sutter on cello, and William Wolfram on piano, will play works by Beethoven and Tchaikovsky. On Saturday evening, January 13 at 6:00 and again on Sunday afternoon, January 14 at 2:00, a quartet consisting of Mark Peskanov on violin, Andrew Gonzalez on viola, Sam Bae on cello, and Michael Kimmelman on piano, will perform works by Bach, Schubert, and Mozart. On Saturday evening at 8:00 and Sunday afternoon at 4:00, these same musicians will play works by Schumann, Schubert, and Mozart. There are details for each concert and you may buy tickets here. Following this weekend’s series of concerts, Bargemusic will go on winter break, with concerts resuming the weekend beginning Friday, March 9.